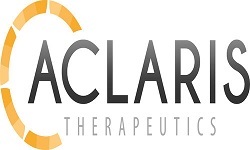 Aclaris Therapeutics, Inc, a dermatologist-led biopharmaceutical company committed to identifying, developing, and commercializing innovative therapies to address significant unmet needs in aesthetic and medical dermatology and immunology, today announced positive interim data from its Phase 2 clinical trial (AA-202 Topical) of ATI-502 for the treatment of Alopecia Totalis (AT) or Alopecia Universalis (AU), the more severe variants of Alopecia Areata (AA). ATI-502, an investigational topical Janus Kinase (JAK) 1/3 inhibitor (ATI-502) is the most advanced topical JAK inhibitor in clinical trials for AT/AU in the United States. This randomized, double-blind clinical trial is being conducted at 2 study sites and will evaluate the pharmacokinetics, pharmacodynamics, and safety of ATI-502 compared with vehicle in 11 patients with AT or AU over 28 days of treatment, followed by a 6-month open-label period when all patients receive the drug. AA is an autoimmune dermatologic condition typically characterized by patchy non-scarring hair loss on the scalp and body. More severe forms of AA are characterized by a total scalp hair loss (AT) or total hair loss on the scalp and body (AU). Today, we report interim results for 6 of the 11 enrolled patients; data from the full cohort will be reported in the future. Systemic exposure was low as indicated by plasma drug levels that were below the limits of quantification (1ng/ml) in all subjects at day 28. • Consistent with low systemic exposure, no significant changes in circulating T, B and NK cells were observed at day 28. To assess skin penetration, punch biopsies were obtained at baseline and day 28 which demonstrated topical ATI-502 absorption consistent with pre-clinical skin models. • Mean of 5650 nanograms/gram at day 28 (range 3130 – 8170 ng/g). 2 patients had marked elevation of the interferon gamma and cytotoxic T-cell gene expression signatures at baseline: one received active drug and one received vehicle. At day 28, the patient on active drug demonstrated a positive change in the 2 biomarkers, while the patient on vehicle did not demonstrate a positive change in the 2 biomarkers. 2 patients had low elevation of the interferon gamma and cytotoxic T-cell gene expression signatures at baseline: one received active drug, one received vehicle. At day 28 both patients showed a partial positive change in the 2 biomarkers. 2 patients had no elevation of the interferon gamma and cytotoxic T-cell gene expression signatures at baseline: both patients received active drug. At day 28, neither patient showed any material change in the 2 biomarkers. No serious adverse events (SAEs) were reported during the 28-day dosing period. One subject receiving ATI-502 withdrew from the trial due to an unrelated SAE of major depression during the open-label extension period. This data is the first indication that ATI-502 is absorbed through the human skin in the clinical setting and engages the target. The results also demonstrate the pharmacodynamic effect of modulating the appropriate genes associated with the interferon-gamma pathway and cytotoxic T-lymphocytes, which are 2 of 3 biomarker components of the Alopecia Areata Disease Activity Index (ALADIN) score. Our hypothesis is this response can be predicted by a patient’s baseline genetic signature. 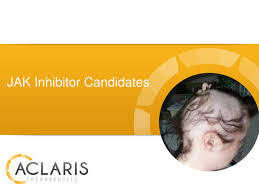 “This is the first time we have demonstrated that Topical ATI-502 is positively impacting the genetic signature implicated in alopecia areata,” said Stuart Shanler, M.D., Chief Scientific Officer of Aclaris Therapeutics, Inc.
Alopecia areata is an autoimmune disease that results in partial or complete loss of hair on the scalp and body. The scalp is the most commonly affected area, but any hair-bearing site can be affected alone or together with the scalp. Onset of the disease can occur throughout life and affects both women and men. AA can be associated with serious psychological consequences, including anxiety and depression. AA affects up to 2.0% of people globally at some point during their lifetime (i.e. incidence) and up to 0.2% of people are affected at any given time (i.e. prevalence). There are currently no drugs approved by the FDA for the treatment of AA. Any statements contained in this press release that do not describe historical facts may constitute forward-looking statements as that term is defined in the Private Securities Litigation Reform Act of 1995. These statements may be identified by words such as “believe”, “expect”, “may”, “plan”, “potential”, “will”, and similar expressions, and are based on Aclaris’ current beliefs and expectations. These forward-looking statements include expectations regarding Aclaris’ clinical development of its JAK inhibitor drug candidates. These statements involve risks and uncertainties that could cause actual results to differ materially from those reflected in such statements. Risks and uncertainties that may cause actual results to differ materially include uncertainties inherent in the conduct of clinical trials, Aclaris’ reliance on third parties over which it may not always have full control, and other risks and uncertainties that are described in the Risk Factors section of Aclaris’ Annual Report on Form 10-K for the year ended December 31, 2017, Aclaris’ Quarterly Report on Form 10-Q for the quarter ended March 31, 2018, and other filings Aclaris makes with the U.S. Securities and Exchange Commission from time to time. These documents are available under the “Financial Information” section of the Investors page of Aclaris’ website at http://www.aclaristx.com. Any forward-looking statements speak only as of the date of this press release and are based on information available to Aclaris as of the date of this release, and Aclaris assumes no obligation to and does not intend to, update any forward-looking statements, whether as a result of new information, future events or otherwise.